Enough talk of the NGCC and electronic ID cards. We’re back on the track and about to embark on two massive weekends of racing in Korea. Just a few hours from now, we’ll find out if Dongbanui Gangja and Tough Win will indeed face each other at Seoul Race Park this coming Sunday in the Group 3 KRA Cup Classic. Korea’s best two horses went head-to-head for the first time two months ago in the Busan Metropolitan with young upstart Tough Win taking the honours after double Grand Prix Champion Dongbanui Gangja veered suicidally wide on the final turn. What will happen at Seoul? Full preview to come over the next couple of days. Regardless what happens there though, a week later we’re guaranteed another top class race the when the 2010 Triple Crown concludes with the Group 2 Minister’s Cup – formally, and wonderfully, known as the Minister for FAFF (Farming, Agriculture, Fisheries and Forestry) also at Seoul Race Park. Derby Winner Cheonnyeon Daero heads north to the capital once more, however, the horse who was second that day, Money Car will not. 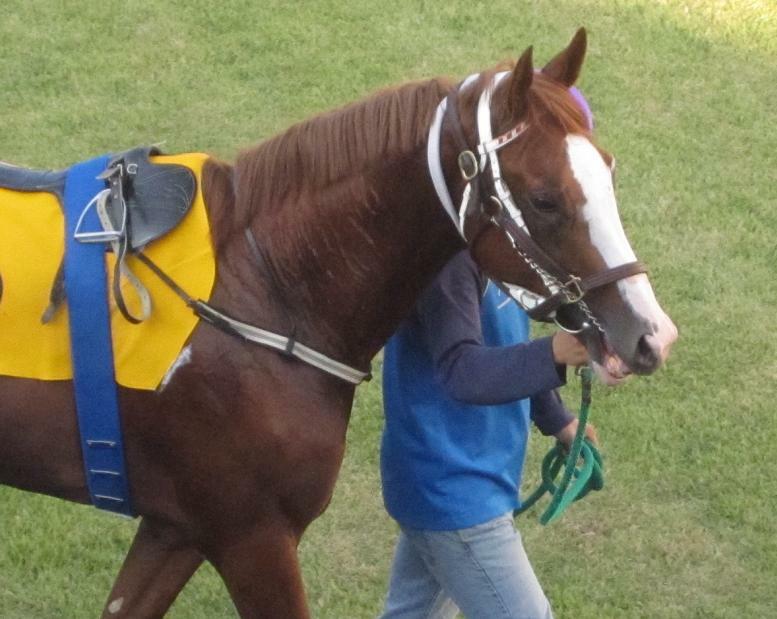 Whether we will ever see the injured KRA Cup Mile winner back on the track is questionable. Nor will long-shot Oaks Winner Euro Fighter be present. However, that doesn’t mean this isn’t set to be an intriguing contest. 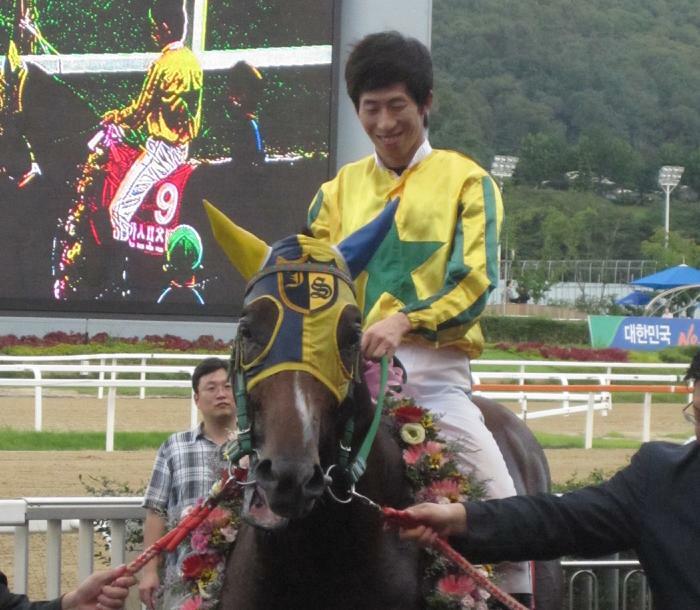 Dangdae Bulpae was third in the Derby but is unbeaten since. Most recently, the son of Biwa Shinseiki dispatched an array of big-name older horses in dismissive fashion in the Gyeongnam Governor’s Cup. He is sure to give Cheonnyeon Daero a run for his money. Then there is Glory Yeonggwang. Sent off at 60/1 in the Gold Circle Trophy earlier this month, he upset the odds – and eleven rivals – to take the prize and earn a place at Seoul. * In Stud news, the KRA announced today that they have purchased the stallion Officer [Bertrando – St. Helens Shadow (Septieme Ciel)], who is currently standing for a $10,000 fee in Kentucky. Officer will be flown to the KRA’s stallion station on Jeju Island where the eleven year-old will be standing alongside the likes of Ecton Park, Volponi and Menifee as well as more established Korea-based sires Revere, Didyme and Psychobabble. According to the National Gaming Control Commission (NGCC), 6.1% of Koreans are addicted to gambling. Also, the addiction rate among those who actually attend gambling establishments (i.e. the track and Gangwon Land Casino) is supposedly 61% (Gyongmaman is going to ask for a show of hands on the fourth floor next Saturday). Indeed, according to their criteria, your correspondent is among those in urgent need of help. It is on its way; in October, trials will begin of an Electronic ID card which the NGCC hope to make compulsory for all punters. The card will track every bet made by an individual. All legal punters, that is. The move comes in a month where gambling has again been in the news with two high profile cases – one tragic, one mildly pathetic. In the first case, a man in Gangwon Province has been charged with murdering his wife and teenage son following a quarrel over his gambling debts. In the second, entertainer (and that word is used loosely) Shin Jung Hwan is on the run after allegedly running up big gambling debts in Cebu. Falling foul of not just the loan-sharks, but also the law that makes it illegal for a Korean citizen to gamble even while overseas, Shin can’t return to Korea for fear of being arrested. Shin claimed that in fact, he hadn’t been gambling but had instead contracted dengue fever and a picture purportedly showing him in hospital in the Phillippines was promptly uploaded to his website. However, KBS TV – until recently one of his employers – went to the hospital in question and found that he had been given a clean bill of health. Shin is now reportedly recovering from whatever ails him in Macau. He probably won’t catch Dengue fever there. Of course, while it is insensitive in the extreme to compare the two cases, both have brought the spotlight back on the issue of gambling. Likewise, in neither of the two cases was the alleged gambling debt run up by legal means. However, it is the legal outlet of racing that is going to bear the brunt of regulation. Initially the ID card trial is going to involve two sets of subjects. The first group are going to be anonymous – their personal details will not be known, the card will simply track their betting. The second set – and you can be sure that this is the one which will get the final go-ahead – will include punters’ personal information. Will it have any effect? Perhaps, but while having to produce an ID card imay decrease the practice of “window-hopping” whereby to get round the maximum bet of 100,000 won, a bettor goes to several windows or machines before a race, placing the maximum bet each time, those kinds of punter are generally well aware of the various non-legal options open to them. 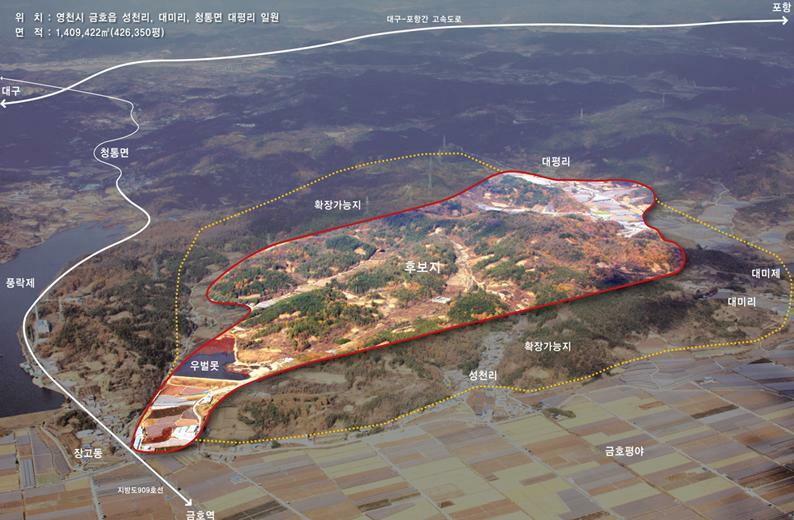 The Korea Racing Authority (KRA) recently confirmed that the nation’s third thoroughbred race track is to be built outside the city of Yeongcheon, North Gyeongsang Province. Given ever-stronger anti-gambling sentiment in government, the opening of Yeongcheon could have major implications for the future of horse racing in Korea. It may sound counter-intuitive but it is precisely becase of ever increased government regulation that the track is being built. The puritans on the National Gaming Control Commission (NGCC), who last year ordered the KRA to close down its internet betting operations, has also ordered the KRA to decrease the amount of off-track betting activity. It has “recommended” that the ratio of off-course to on-course betting turnover be no greater than 50-50 by 2013. Currently approximately 70% of all wagering is done off-track at the “KRA Plaza” betting outlets located around the country. Privately many in the KRA believe that the NGCC will not stop until all (legal) off-track betting is ended. A new racecourse therefore has become necessary. Ostensibly, Yeongcheon was chosen due to its location close to Daegu, Korea’s third-largest city, although many believed that a second track in the Seoul/Gyeonggi area, where 50% of the country’s population lives would have been a better option. 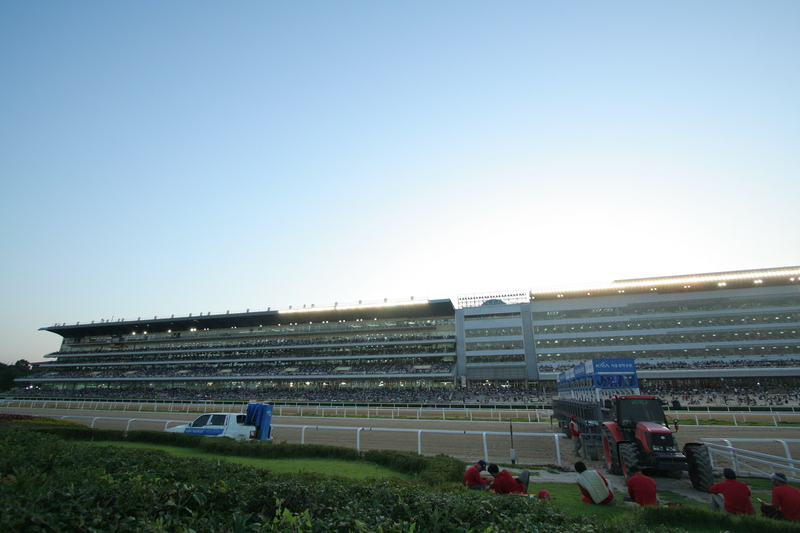 The opening of Yeongcheon Racecourse Park – as it will officially be called – could also see some fundamental changes made to the structure of Korean racing. Not only is the KRA required to minimise off-track operations, it is also required to minimise those on-track. The NGCC has long been pushing for a revenue cap on the KRA, that is, it would only be allowed to accept a certain value of bets within a one-year period. While the NGCC might be insane, the government, who have to rubber-stamp any proposal, enjoys the substantial tax revenues it receives from racing. Instead a compromise of a firm cap on the number of races that can be run looks inevitable. This means that Yeongcheon’s opening will dramatically reduce the number of races run at Seoul. Currently, plans are for each of the three thoroughbred tracks – Seoul, Busan and Yeongcheon – to run 87 days of racing in a year. This is similar to what Seoul does now but instead of the current 11 or 12 races in a day, they will be limited to 8. This means that all three tracks will run 696 races per year for a total on the peninsula of 2392. Each track is also set to get a three or four month shutdown at some point during the year. Accordingly, a large number of trainers will need to be redistributed away from Seoul. Plans for Yeongcheon include an official opening in 2014 with an international race to be run within the same year. This would perhaps be the same “international race” that the KRA has been planning to hold every year since 2004 as part of its “internationalization” plan. Overall, while it is bad news for Seoul based punters, perhaps anything that reduces that capital track’s stranglehold over Korean racing is a potential blessing. The vested interests and pre-historic Unions that essentially hold the power at Seoul have long meant that any positive developments in improving the quality of racing in Korea have been frustrated. Despite their best efforts, particularly earlier this year, Union power at Busan has so far been limited since that track opened in 2005. 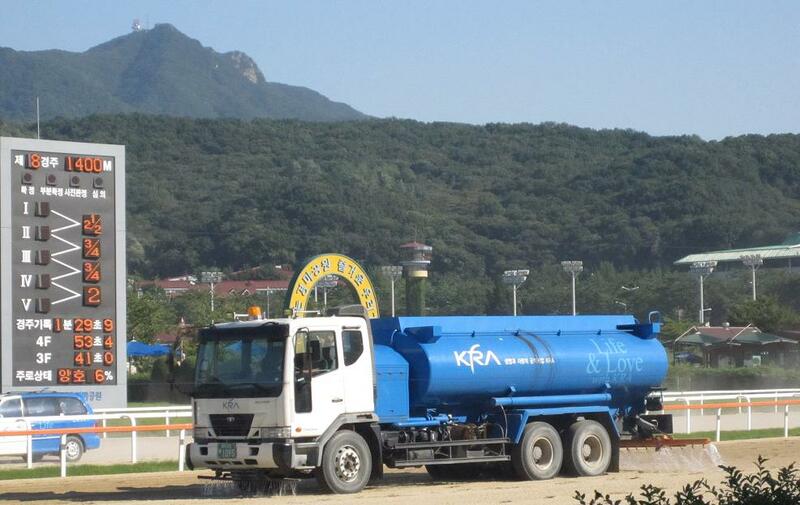 With a third track to worry about and a smaller power base at Seoul to work from, it could be time for the KRA to wrest back control of Korean racing. If it really wants to. * Meanwhile, the NGCC’s plans to equate legal gamblers with criminals continue. From next month, trials of Electronic ID cards, which the NGCC plans to make mandatory for any Korean citizen wishing to indulge in a legal wager, will begin. More on this soon. Second favourite Golden Rose came out on top in the battle of the fillies & mares in the Dong-A Ilbo Cup at Seoul Race Park this afternoon. After yesterday’s glorious weather, it was a dismal afternoon in the capital. It rained. A lot. It wasn’t heavy but just light, incessant drizzle that over a period of hours slowly soaked everything and everybody. Not that that mattered to Moon Se Young and Golden Rose. 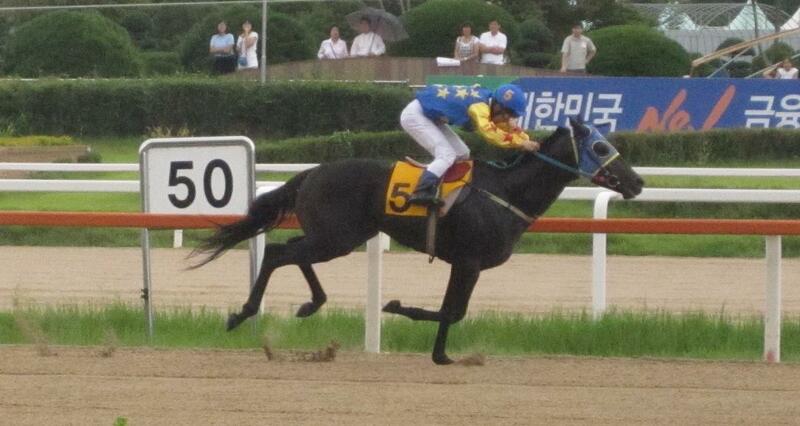 After Misopia set the early pace in the seven furlong race, Tamnahwanhui hit the front with a furlong to go. Golden Rose was travelling the quicker, however and cruised past the favourite to score victory by nearly two lengths. Meotjin Segye was third. Four-year old Golden Rose was recording her fifth win from seventeen starts and her first this year. 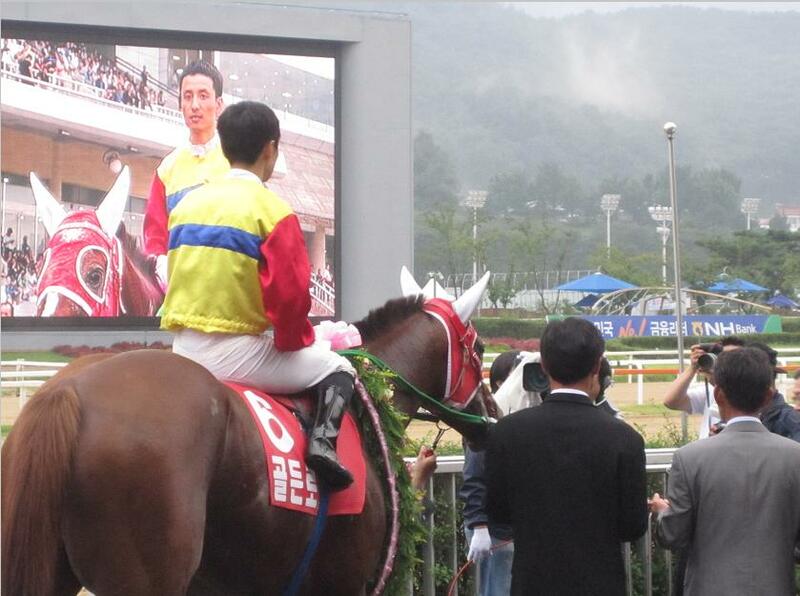 Japanese jockey Yoshi Aoki had a brief and low-key stint at Seoul Race Park last year. This week he returned to Korea to take up a license at Busan and in his first weekend of racing, he’s already achieved more than the vast majority of visiting riders do in their entire Korean careers. Riding 60/1 outside Glory Yonggwang, Aoki grabbed a shock victory in the Gold Circle Trophy, a race sponsored by South Africa’s Gold Circle organisation. It was a real come-from-behind performance by Glory Yonggwang who was last coming into the home straight. In the end, he came past favourite Deep Desire in the last few strides to win by half a length. The shocks weren’t finished there at Busan. Next up was the Macau Jockey Club Trophy, which saw 33/1 shot Global Champ take the honours. The four-year old held off fellow Australian-bred colt Dudeurim to take the prize by two and a half lengths. Two of Seoul’s up-and-coming stars were in action this afternoon and both Big Easy and Jilpunggangho further enhanced their ever-growing reputations. First up on a beautiful early autumn afternoon in the capital was Big Easy. The three-year old colt was making his second appearance in a class 2 race and, after being sent to the front early by Jung Ki Yong, never looked in any great danger as he led the field home by a length. Big Easy [Agnes Gold – Belmont Grace (Adjudicating)] was winning his seventh race in eight total starts and will be running at class 1 level next time. Already at class 1 today was Jilpunggangho [Max’s Pal – Spicy Soup (Alphabet Soup)]. It was a close-run thing after early pace-setter Hallyu Star faded away in the home straight. 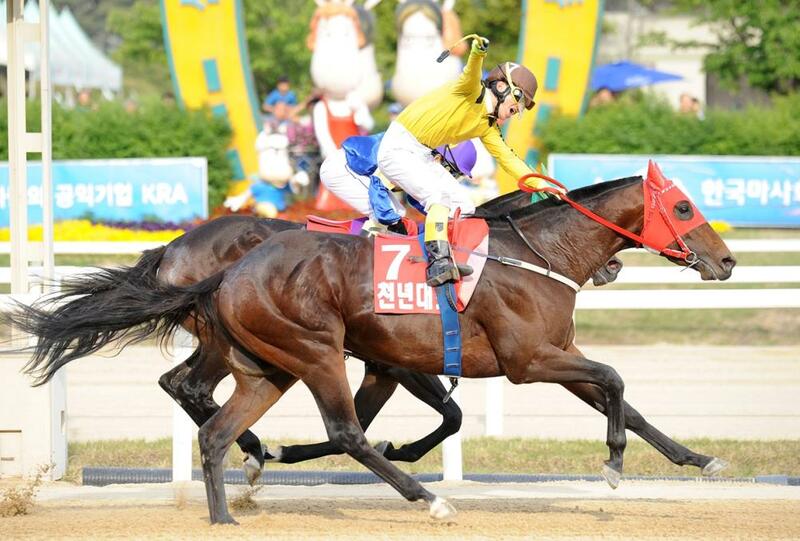 It looked for a while as though former champion mare Lucky Mountain was going to return to the Winner’s Circle for the first time since March, however, Jilpungganho and Choi Bum Hyun just did enough to get up by a nose and score a seventh win from eleven starts for the colt. 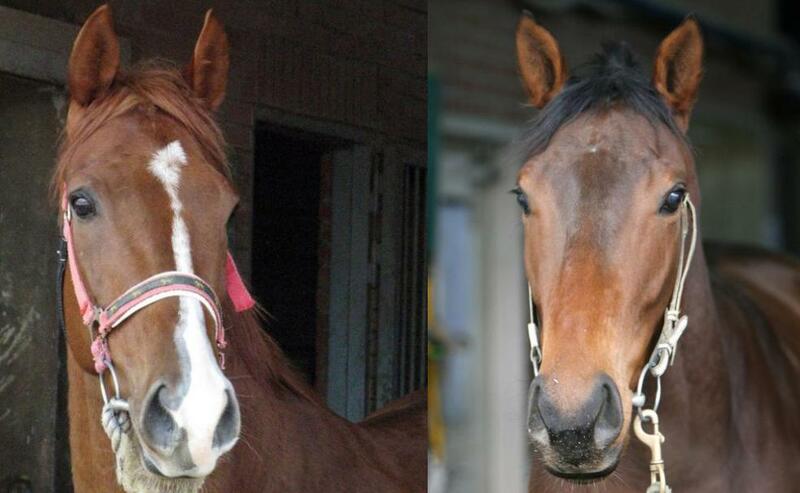 Despite both officially being Korean bred and three-years old, neither are eligible for the Classics with both their dams being imported to Korea while in-foal. Except for the Classics, however, that doesn’t matter and we could be in for some exciting performances as both progress to the elite tier of Korean racing. Today was significant in that there were thirteen races run in a single card for the first time for several years. The additional race being run to make up for the race that was lost due to a tote board failure three weeks ago. Also significant for punters was that for the first time in goodness knows how many weeks, umbrellas weren’t required as the track basked in perfect punting conditions. In a season where three-year olds have in general been disappointing, today two of that generation overcame their older foes to land big prizes. At Seoul Best Holls was the suprise winner of the Ilgan Sports Cup, while down at Busan, Dangdae Bulpae, third in the Derby earlier this year, landed the Gyeongnam Governor’s Trophy. Punters at Seoul sent Best Holls off at 44/1 to win the Ilgan – the longest running “name” race on the Korean racing calendar. Under Lee Sang Hyeok, the colt was always showing towards the front and when long-time leader Daehanbobae began to weaken in the home straight, he took over. Suseong TX proved his strongest challenger, but he was able to hold off the five-year old by a neck to take victory. 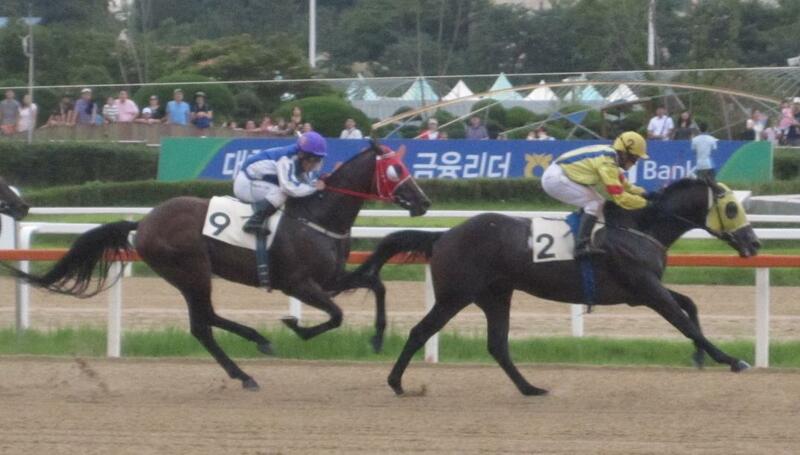 Pre-race favourite Geumgangi was the big disappointment, the Munhwa Ilbo winner finishing way back in eleventh. Best Holls [Fiercely – Onethindime (Tactical Advantage)] was winning his fourth race in his last five starts and his fifth in total. 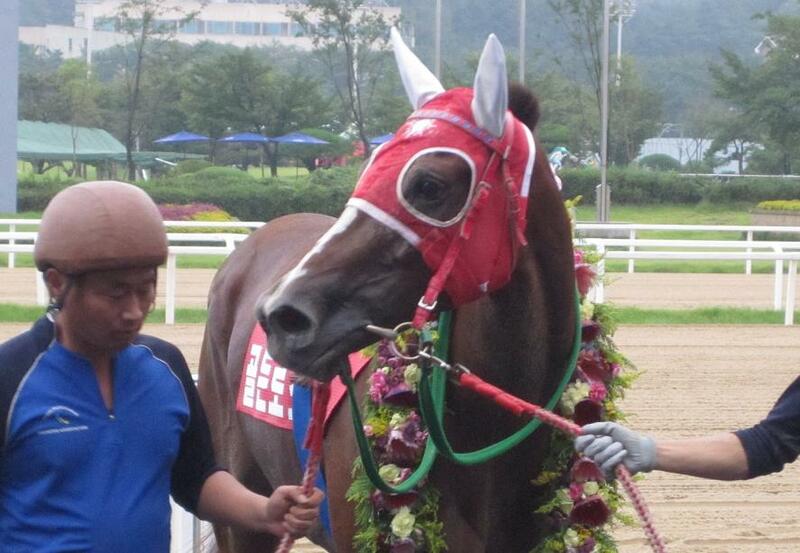 At Busan, Sangseung Ilro was an early scratching for the Group 3 Governor’s Trophy which reduced the field to seven. Yeonseung Daero was sent off slight favourite following his excellent performance in the Busan Metropolitan in his last outing. 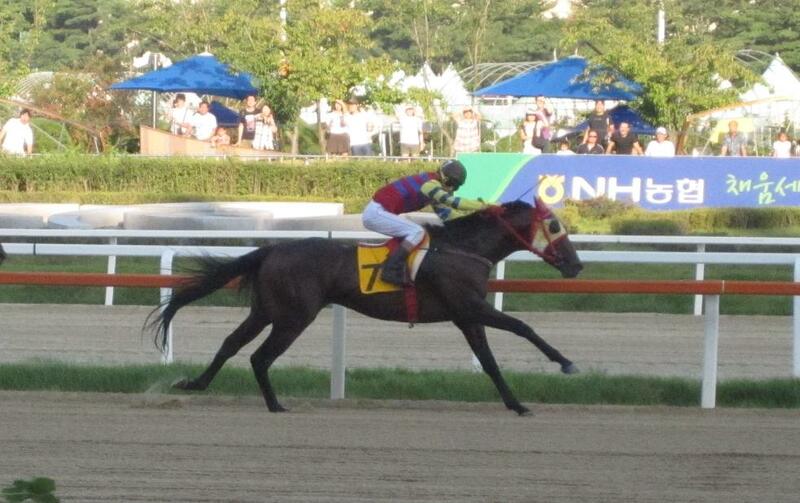 As ever, Minister’s Cup winer Namdo Jeap bounced out of the gate and into an early lead. Unlike in the Minister’s Cup, he couldn’t keep it as Dangdae Bulpae and Jo Chang Wook came through and took victory by two lengths. Golden Appeal just headed Namdo Jeap to grab second. As for Yeonseung Daero, he never got going. As has been the story of his career, he’s either very good or he doesn’t show up at all. Today was the latter. Dangdae Bulpae now has seven wins from a total of ten starts. He must surely be favourite when the leading three-year olds reconvene at Seoul in November for the final leg of the Triple Crown. 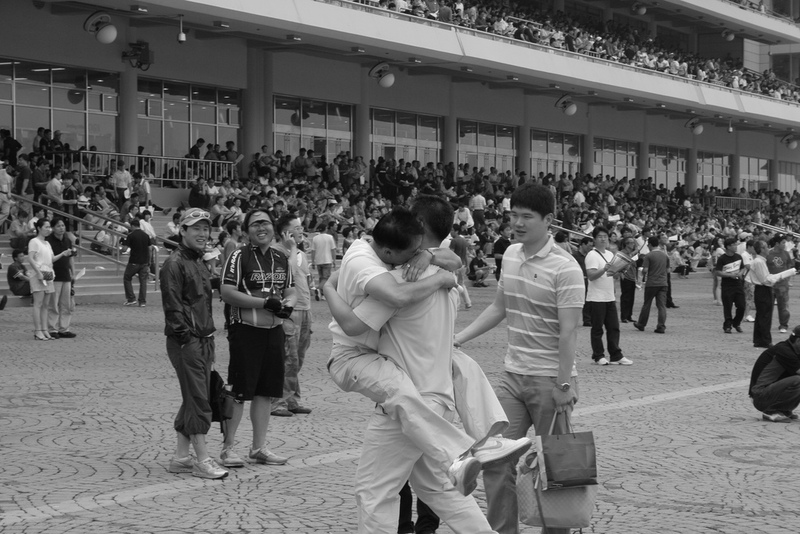 Back at Seoul two jockeys were celebrating their first wins at the track today. Japanese rider Hirotaka Hamada – tipped by some to be the foreign jockey who finally makes it big at Seoul – stormed to victory on Sun Best in race 1 to record his first win in Korea following his debut last week. It was an even bigger day though for apprentice rider Lee Gang Seo. Riding in his fourteenth race, Lee guided 47/1 outsider Gippeumui Geunwon in race 6. After all the stakes action was over and done with, there was still a big handicap to sort out at Seoul. Bally Brae was there, however the eight-year old – with only one win this year – was assigned a preposterous 61kg to carry, 7kg more than any other horse in the race. Jockey Moon Se Young, while not normally considered a contender for PETA membership, cares deeply about this horse and eased him in the home straight when it became obvious a place finish wasn’t on the cards. Up ahead of them, five-year old Mr. Loving Life took the honours, ahead of favourite Victory Town. Download English language Stewards’ Report from Busan.